Did you know that 1 in 10 people will have a seizure and 1 in 26 people will develop epilepsy in their lifetime? Most do not, which is partly the purpose behind 50 Concerts 50 States for Epilepsy Awareness. 50 Concerts 50 States for Epilepsy Awareness is a concert series designed to raise awareness and spread facts about epilepsy. The other purpose is more personal; to honor Carolina Miller, who passed away tragically in August 2011 from SUDEP. Carolina, age 25, was diagnosed with epilepsy in her teenage years and the cause was unknown. Not unlike autism, epilepsy is a spectrum of disorders. Carolina was like many people living with epilepsy in that her seizures were infrequent and controlled with medication. She was not aware of the threat of SUDEP. Neither was her husband, Pennington NJ resident Eric Miller, who created and runs this series as part of his efforts to raise awareness around epilepsy in Carolina’s honor. 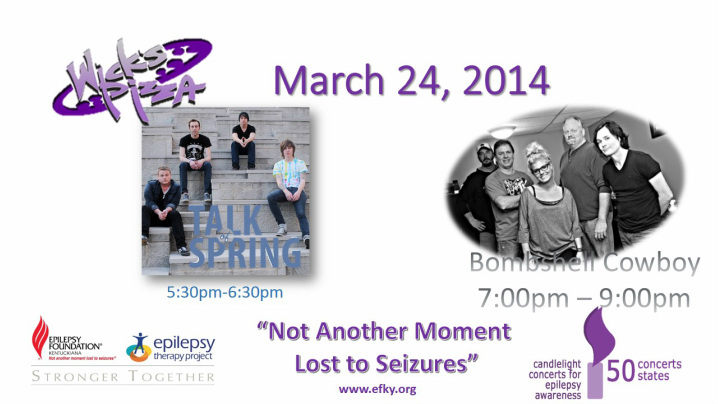 Talk of Spring 5:30 p.m. - 6:30 p.m.
Bombshell Cowboy (Allison from the Voice) 7:00 p.m. - 9:00 p.m. Please present the voucher below to your server for the Epilepsy Foundation of Kentuckiana to receive a 10% proceeds of all sales. Thank you for your continued support!